Andrew Smith was born Oet. 17,1816, in "Field's Settlement," in the town of Hounsfield, Jefferson Co. He was the eldest in a family of six children. His father, Richard Smith, was a native of Woodstock, Conn., and came to Watertown about the year 1811, and shortly afterward was enrolled as an "Artificer," and served during the war. After its close he purchased 50 acres of land lying contiguous to the farm now owned by his grandson, F. R. Smith, and where he lived until his death, which occurred April 6 1868. He was a man of sterling qualities, and largely identified with the early history of this section of the township. The only educational advantages afforded in those days were the country common schools; these our subject attended in the winter, working upon his father's farm in the summer. He, however, acquired a good practical education. Industry, economy, and integrity were the first and last lessons of his boyhood. They were the guide of his life, which is attested by the success he met with in busiuess,and the high respect and love of his neighbors. Although Mr. Smith took a proper interest in political matters, the whole ambition of his life and motive spring of every effort was to be a good farmer. When twenty-six years of age he married Miss Esther W. Collins, daughter of John and Catharine (Potter) Collins, who were among the early settlers of Watertown. They were natives of Rhode Island, and emigrated to Jefferson County in the year 1811. Mrs. Smith was born Oct. 18, 1819, and survives her husband, and her ruddy face and bright eye bespeak health and a long life, and is all that is expressed in the terms amiable and intelligent. After their marriage Mr. Smith rented his father's farm, which he carried on for several years. Being successful, he purchased land, and soon became the proprietor of one of the finest farms in the township, and one of the leading farmers, and a man of rare business ability. 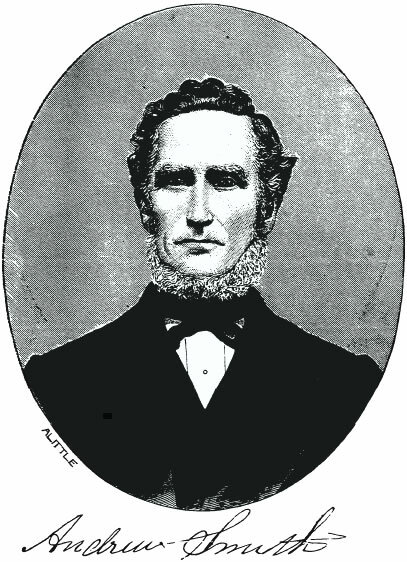 Thoroughly appreciated by his fellow-townsmen, he was elected to the office of supervisor, which position he filled with credit to himself and his constituents, and as an acknowledgment of his ability, sterling worth, and high social qualities, he was nominated, for two successive terms for the Assembly; but his party being largely in' the minority, he was defeated. Mr. Smith was pre-eminently a self-made man. Beginning life when the country was new, with only his natural resources for his capital, he worked himself up to a high position, socially and otherwise. With a grasp of perception and a masterly management of all, he conquered success in every movement of his life, which is an illustrious example to young men of the capabilities of character and manhood. He died July 8, 1876, leaving his widow and three children to mourn his loss. His children were all born upon the old farm. Uretta E., wife of Henry O. Kenyon, Esq., of Adams; Frank R., born Oct, 25, 1849; Alice, born June 30, 1860. Two children, Viola and Irwin R., preceded their father. Source: Durant, Samuel W. and Henry B. Peirce. History of Jefferson County, New York, With Illustrations and Biographical Sketches of Some of its Prominent Men and Pioneers. Philadelphia: L.H. Everts & Co., 1878. p 417.